Since inception, JAZZWA has earned a reputation for the presentation of quality jazz events and targeted strategic initiatives, and the organization continues to work to serve musicians, local government and the general community as a whole in the pursuit of its constitutional objectives. JAZZWA’s educational arm, JazzNOW! assists students and schools involved in jazz education through an annual program that includes Jazzcamp, Youth Jazz Jam Sessions and School Incursions. The JazzNOW! program aims to teach aspiring young musicians about jazz music and improvisation and to provide them with access to top jazz musicians and jazz educators. The Jazzaziz project was created as a vehicle to record original contemporary jazz composed and performed by WA jazz musicians. The newly recorded works (as well as some pre-existing WA jazz recordings) are released on Jazzaziz compilation CD albums in order to promote the music locally, nationally and internationally and thereby draw attention to the quality and diversity of contemporary jazz from WA. Jam sessions help to integrate jazz musicians from different backgrounds and stylistic persuasions, and they also create a platform for the sharing of ideas that leads to a greater connection amongst the musicians, audiences and the general public. The Explorations project is therefore designed to preserve the jam session as an integral part of the WA Jazz community that nurtures the art of performing spontaneous, un-rehearsed jazz with untested and (mostly) unplanned combinations of musicians. 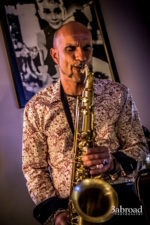 JAZZWA has been bringing jazz to regional Western Australian audiences for many years, and this project area continues to be an important focus. In 1988 JAZZWA staged performances of the “Western Australia Suite” in Kalgoorlie and Geraldton and later would auspice numerous Country Arts WA tours including “Imagine” (2002, Helen Matthews), “Adapt” (2003, Salamander), “Simply Sinatra” (2003, James Flynn), “Descarga & Dance” (2008, Descarga) to name a few. More recently JAZZWA has been working with local organizations and presenters such as Arts Margaret River, Australind Senior Highschool (a jazz specialty school) and The Bunbury Eistedfodd to create a jazz touring circuit in WA’s Southwest region with tours mounted in 2010 & 2011 (Backlash Jazz Quintet), and 2012 (Freddie Grigson Quartet). In 2011, JAZZWA facilitated the creation of the UWA Jazz Club (UWAJC) to organise and promote jazz-related activities on campus at The University of Western Australia. Although an autonomous entity, the UWAJC maintains strong ties with JAZZWA and aims to provide UWA students (music students and non-music students alike), staff and alumni with an easy and fun way to keep in touch the jazz artform through a broad range of activities including performances, jam sessions, listening sessions, workshops and social events. Founded in 2007 by Alan Corbet (a talented jazz pianist in his own right), JAZZWA’s Piano Perspectives project seeks to bring attention to the artform of solo jazz piano whilst showcasing the nuance and full dynamic range of the finest quality instruments available. The first Piano Perspectives concert featured internationally acclaimed (Australian born) pianist Barney McAll and was held in November 2007 at The Eileen Joyce Studio at the University of Western Australia. Later concerts also featured Geoffrey Keezer (Music Auditorium, WAAPA – 2008) and Aaron Choulai (Callaway Theatre , UWA – 2009). The expanded 2010-11 Piano Perspectives project featured WA pianists: Tom O’Halloran & Graham Wood, who were each commissioned by JAZZWA to write a work for two pianos. The new works were recorded and subsequently premiered at the Government House Ballroom in Dec 2011.